Gain a clear understanding of pathophysiology and lab testing! Clinical Chemistry: Fundamentals and Laboratory Techniques prepares you for success as a medical lab technician by simplifying complex chemistry concepts and lab essentials including immunoassays, molecular diagnostics, and quality control. A pathophysiologic approach covers diseases that are commonly diagnosed through chemical tests - broken down by body system and category - such as respiratory, gastrointestinal, and cardiovascular conditions. 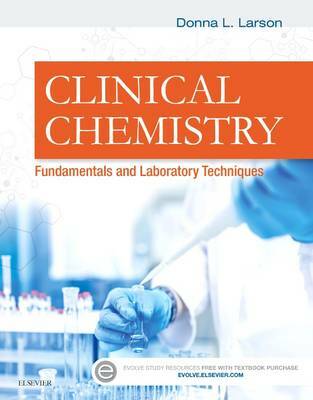 Written by clinical chemistry educator Donna Larson and a team of expert contributors, this full-color book is ideal for readers who may have minimal knowledge of chemistry and are learning laboratory science for the first time. Full-color illustrations and design simplify complex concepts and make learning easier by highlighting important material. Case studies help you apply information to real-life scenarios. Pathophysiology and Analytes section includes information related to diseases or conditions, such as a biochemistry review, disease mechanisms, clinical correlation, and laboratory analytes and assays. Evolve companion website includes case studies and animations that reinforce what you've learned from the book. Laboratory Principles section covers safety, quality assurance, and other fundamentals of laboratory techniques. Review questions at the end of each chapter are tied to the learning objectives, helping you review and retain the material. Critical thinking questions and discussion questions help you think about and apply key points and concepts. Other Aspects of Clinical Chemistry section covers therapeutic drug monitoring, toxicology, transplantation, and emergency preparedness. Learning objectives in each chapter help you to remember key points or to analyze and synthesize concepts in clinical chemistry. A list of key words Is provided at the beginning of each chapter, and these are also bolded in the text. Chapter summaries consist of bulleted lists and tables highlighting the most important points of each chapter. A glossary at the back of the book provides a quick reference to definitions of all clinical chemistry terms.